For half a century the Wergo label has been synonymous with contemporary music. Its repertoire comprises more than 600 CDs which have won many awards and prizes, and is a major collection of 20th-21st-century music, portraying almost all established contemporary composers. As a result, the Wergo label is not only part of the history of new music but also continues to make contributions to it. In May 2012 Wergo celebrates its 50th anniversary. 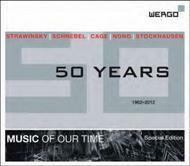 In celebration, Wergo is publishing a 5-CD set with music from five decades - all for an especially reasonable price.